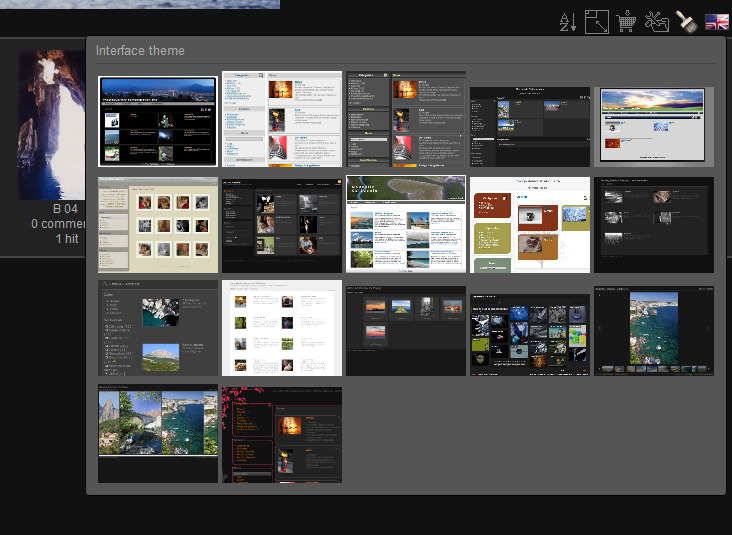 About: Lets logged or unlogged user change appearance of gallery (via switching to different theme) on gallery home page. Based on Language switch. By default only theme thumbnails are displayed. Some bug fixes. Added languages. Version compatible with piwigo 2.1.*. Unzip into plugins directory of your piwigo 2.1. * installation. Edit file main.inc.php if you want to configure the switch (theme names or theme icons). Install and activate it in Administration - Plugins - Manage. Upgrade done according to Language switch upgrade. Theme icons appears now in the same was as language icons. Minor bug fixed: If you change theme when you are inside gallery, then you will remain in the gallery. Now via simple edit you can choose, if you want to provide icons for favourite themes or select control displaying all available themes. Unzip into plugins directory and install and activate in Administration - Specials - Plugins.